Measurement of changes in the shape of the Earth provides critical insight into a variety of processes of interest to science and society - from subsurface movements of magma, strain before, during and after earthquakes, to motion of ice sheets. Until the late 20th century, measurement of Earth deformation was always time-consuming and frequently perilous because it required the observer to physically touch a point on the Earth's surface with a surveying instrument or establish an expensive observatory. In spite of intense efforts, and advances such as the Global Positioning System (GPS), even today deformation of vast portions of the Earth is not known or not measured frequently. In the last few decades, a capability has emerged to measure deformation between satellite images acquired a few days or years apart, leading to a great increase in both the percentage of the Earth's surface deformation that can be monitored as well as the frequency of such observations. Here, we focus on a powerful satellite imaging technique for deformation monitoring known as Interferometric Synthetic Aperture Radar (InSAR) that is revolutionizing the way we see the Earth and the evolution of its shape over time. InSAR is an exciting new tool because it overcomes many practical limitations. Large, remote areas (100's of km) can be surveyed for deformation with high spatial resolution (about 20 m/pixel). For example, we were able to assess the deformation at more than 900 volcanoes in the central Andes over the last decade in a few weeks time, instead of the years to decades it would take to make similar measurements on the ground. While ground measurements from continuously operating GPS stations and other instruments can observe deformation over timescales of seconds, InSAR is complementary in that it can take much more spatially extensive measurements on a weekly or monthly basis. Also, InSAR is able to take measurements without putting humans or expensive instruments in jeopardy -- for example InSAR observations can be made in erupting volcanic craters. This map shows earthquake and volcanic deformation in the central Andes between 1992-2005 as measured by the ERS-1, ERS-2, and Envisat radar satellites of the European Space Agency. Each color cycle represents a change of 5 cm in the distance from the satellite and the ground between satellite overflights. The direction of the radar beam is shown by the black arrow at the top of the image. The ultimate cause of the earthquakes and volcanic deformation is the subduction of the Nazca Plate beneath South America. The trench is the red line, and a reference location map is in upper right. Along the coast are the deformation patterns from four subduction zone earthquakes along with their focal mechanisms. The earthquakes in 1995, 1996, and 2001 are shallow thrust earthquakes (depths 10-60 km), while the 2005 is a deep (about 100 km) extensional event. 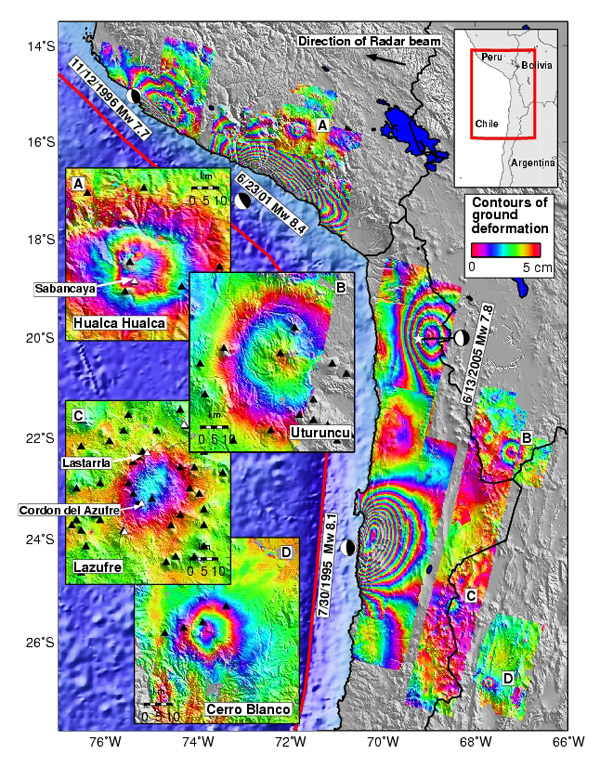 Inset maps are detailed looks at the centers of volcanic deformation: Hualca Hualca, Peru (A), Uturuncu, Bolivia (B), the source between Lastarria and Cordon del Azufre on the Chile/Argentina border (called ``Lazufre'' here) (C), are inflating, while Cerro Blanco in NW Argentina is deflating (D). Interferogram time spans are as follows: Lazufre and Uturuncu 5/96-12/00 (4.6 yr), Cerro Blanco 5/96-10/00 (4.4 yr), and Hualca Hualca 6/92-4/96 (3.9 yr). Cataloged volcanoes are shown as black triangles and ``potentially active'' volcanoes are white triangles. 1. High resolution maps of deformation before, during and after earthquakes have revealed numerous break-throughs. The spatial patterns of deformation in the weeks to decades after large earthquakes have been used to place bounds on the fault frictional properties as well as the viscosity of the sub-surface. In addition, the importance of poro-elastic deformation has been discovered - that is, deformation from water movements caused by earthquake-induced adjustments in the regional stress field. 2. Ice sheets are much more dynamic than previously thought, with important consequences for predicting sea level rise. 3. There are systematic errors in the locations for certain shallow earthquakes. With the InSAR data, refined location procedures can be developed with implications for monitoring nuclear tests, creating better models of the elastic properties of the Earth's interior, and assessing seismic hazard. 4. Magma is moving at many supposedly dormant volcanoes. 5. Groundwater movements beneath major cities and elsewhere exhibit complex spatial and temporal variations, in part influenced by human activities. Though existing InSAR systems have provided many new insights, the satellites to date have not been optimized for InSAR, and a satellite dedicated to InSAR with more frequent and consistent observations could address some very large scale problems in geophysics. Several review panels have stressed that InSAR should be a high priority for US funding agencies. Eventually, constellations of InSAR satellites in a variety of orbits, including possibly geosynchronous orbits, could allow near real time imaging, which would greatly assist in response to natural hazards. Find out about UNAVCO's InSAR-related activites [PDF].